Those who are not star struck, nor are rich and famous received it as yet another confirmation of their belief that the law of the land cannot chastise the rich and the famous. Still others – commentators, anti-corruption activists etc. – saw it as an endorsement of the “truth alone triumphs” motto. As a former IPS officer who has put in forty years in the organisation – I see it quite differently. To me, it is yet another stern warning that the perils of honesty and commitment to the rule of law come with an unacceptable risk – for the policeman. Society has evolved considerably from its earlier identification with courageous and conscientious upholders of law as heroic figures; achievers and the successful are the new role model. In a time when even directors of CBI have been seen to be puny foot-soldiers of the rich and powerful, characters like Patil seem to be chasing illusory, quixotic goals. As a lowly constable, he had the temerity to stand for truth, equality before law and a determination to bring the powerful to justice. In doing so he went against the organizational culture. He was a turncoat of his profession. No wonder the Mumbai police force excommunicated him. The system wreaks punishment in great detail to those who stand for truth in contemporary society, and the utter futility and pointlessness of such a gesture would be evident if we plot the life of the individual in history as opposed to the timeless image of the hero. Satya Harischandra’s insane commitment to fulfill a promise made in a dream cost him his kingdom, and his son. He sold himself into slavery of the worst kind, and even felt duty-bound to ask his wife to part with a portion of the saree covering her modesty. He passed the test and the gates of heaven opened for him. The gods themselves anointed him. Those were the days when gods and men were on equable terms of association - reward, and punishment, redemption and retribution followed close at hand. Patil was similarly seized by a delusional notion called commitment to rule of law; he believed in the grandiose promise of law made grander still by the Latin it is couched in. (Let justice be done though heavens fall). We have rarely seen the heavens fall, but the fall of those who try to bring the powerful to justice is an everyday occurrence. When it confronts the powerful the law of the land reads itself differently from the way it initially wrote itself. So he had the devil to pay for his naïveté. He was subjected to physical threats, he had to go in hiding, he was deprived of his job; his family deserted him, he contracted the most virulent disease that can afflict a human being, was reduced to begging and died an anonymous death. Patil’s victory was both pyrrhic and pointless. The powerful man walked free in a few hours. The policeman’s prolonged suffering, disgrace and ultimate death did not sanctify any cause because no such cause exists today and the just gods who in mythical times rewarded the virtuous and punished the wicked have departed long back, leaving no addresses. But there is cold comfort at hand. Media, the nearest equivalent of God in our godless world, have woken up to him as if he had been incarnate yesterday. Perhaps if it had taken some notice earlier Patil may still have been alive. But no one, it seems, wants martyrdom interrupted because the deaths of these suckers serve a very utilitarian purpose. They help derive a very comforting moral: fighting injustice and corruption in the system is beyond the realm of an ordinary man's effort. So while in principle the society may continue to endorse the values of probity in public life it can merrily go about its business in the usual manner. Ravindra Patils of this world stand to further the cause of justice to their own peril. They are fully aware of the consequences that they stand to face for their obduracy. The system has myriad ways to break them down. 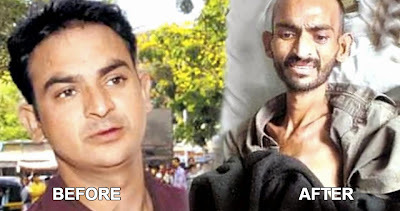 Ravindra Patil suffered one. There are numerous others. It is no secret that the Judiciary favours the one who can afford the best legal brain who are no sale. It is invariably the law that emerges triumphant over justice. As for the media, its passions are of fleeting disposition, aroused with difficulty but passing easily to another tale of wrongs. Really glad to read your blog again after a long time. A sane voice in the wilderness of screaming news and breast beating mass! When DGPs can be harassed who is a lowly constable? If one has decided to base one's life on empirical science, s/he is left with no choice in India but to be Janus-faced at best and a cynical, lying bas***d at worst, unless one is ready for vanavaas or live the life of an 'outsider' of the A Camus variety. Ex-IPS officers and few ex Maharashtra attorneys should form a 'legal defence' team for Ravindra Patil , pedestrians killed by Sallu . Salman not only killed the pedestrians and Ravindra Patil. This monster must be convicted and hanged as soon as possible !